Nisizawa Valley Koyo Tour (西沢渓谷紅葉ツアー) takes you the one of the best valley in Japan. Nishizawa Valley is the valley of Fuefuki River located in north Yamanashi. It is a part of Chichibu-Tama-Kai National park. There are many mountains around the valley, and the valley itself has great hiking course, takes about 4 hours), with the beautiful waterfalls including Nanatsugama-Godan Falls which is one of the 100 best waterfalls in Japan. This tour also takes you to Irori Restaurant to eat Hoto. Hoto is Yamanashi's local Udon Noodle. At the end, you will enjoy great view of Kofu Night scenery from Fruits Park. Period: Late October to early Nov. Bus will not wait for you. So, please be careful about the leaving time and don't be late. Nishizawa Valley is one of 100 unexplored regions which has beautiful nature you can enjoy. On the hiking courses there are eight beautiful waterfalls including Nanatsugama Godan Falls, 100 best waterfalls. 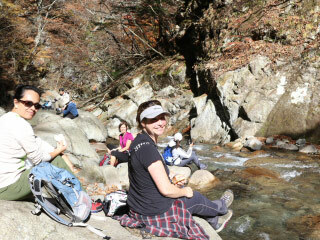 It is about 4 hours of hiking course, 9km. In the beginning, you enjoy river and waterfalls, and half to the end will be easy mountain hiking. Restrooms are located at the entrance and middle resting point. Leaves and flowers are beautiful for all seasons, and rocks of the river is very unique. From the turning spot, the hiking course is placed on the old trolley rail. So, it is very slow and easy. The water of the river come from Mt.Kobushigatake (甲武信ヶ岳), and run in to Fuji river. Enjoy Hoto Noodle. Vegetable Udon noodle with pumpkin. It has a great view of Kofu and Mt. Fuji. The night scenery is one of 3 best night views of Japan. 6:45 at Yokosuka Chuo Station. 7:00 leave at the station. 10:00 arrive at Nishizawa Valley parking. 15:00 back at Nishizawa Valley parking. 16:30 at Fruits park for sighseeing and shopping. 20:30 back to Yokosuka Chuo Station. Tour is managed by Shiki Tour. Contact MLJ for more information and reservation.